SWAT, Pakistan -- The ancient seat of Gandhara civilization in Swat that was vandalized by religious extremists is crumbling due to the neglect of the authorities. The valley, once a popular tourist destination and seat of learning through the ages, was turned into a hotbed of violence when Taliban captured the valley in 2006 and started propagating orthodox version of Sharia through illegal FM radio station. The militants defaced Buddhist statues, monasteries and rock carvings. On October 8, 2007, Fazlullah’s militants defaced a 23-foot high, 7th century seated Buddha, carved in a rock in the lap of a mountain in Jehandabad village. It was the rarest piece of rock art in the region after the Buddhist statues in Bamiyan, Afghanistan that were destroyed by the Taliban in March 2001, says an official of the Swat Museum in Saidu Sharif. However, the Taliban are not the only ones guilty of wrecking such archaeological treasures; the local people have also destroyed archaeological sites to extract stones and bricks for use in the construction of their houses. In some areas, treasure-hunters pillage these sites in the hope of finding valuables and striking a fortune. Lying in the lap of calm and serene Jambil Valley on one side and the Marghazar stream on the other, Batkara Stupa is one of the most important and oldest Buddhist seats of learning in Swat Valley. According to the Archaeology and Museums Department of Pakistan, it was the Buddhist monastery of Ta-Lo, visited by Chinese Buddhist pilgrims during the 5th and 7th centuries. It lies at the eastern end of the ancient capital known as ‘Udyana’ (garden) in the Hindu scriptures of Chich-Li (present day Mingora). The main stupa stands in the middle, around it, crowded stupas, veharas and columns, on the northern side stands a great building and further to the north and west the inhabited area. The stupa underwent five reconstructions, each new one encasing the last from the 3rd century till the 10th century. The other monuments around have been accordingly co-related to the five building periods. During the reign of Ashoka, Buddhism thrived in the Swat valley and spread to Central Asia and China from the 1st century BC to 4th century AD. 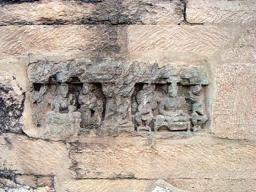 Buddhism left its mark in the form of stupas, monasteries, art, coins, pottery and other artifacts. Sadly, the site, which was once a prime tourist spot especially for Buddhists from across the world, and earned huge foreign exchange, has been deserted since violence erupted in the valley in 2006. Hamayun Firas, a social activist and resident of Batkara lamented on the present situation of the stupa, saying that 30 years ago, the stupa was in a very good condition, its architecture was marvelous and the colours of every decoration and painting were visible, but if you visit it today, no sign of the sublime architecture is visible, even the statues carved into the walls have been broken and lost by the neglect of the concerned department. At Batkara, where 9,484 statues and 107 coins were discovered during excavation, there was a decorated stupa with stone and plaster carvings of the life of Buddha, painted, gilded and topped by umbrellas, today it presents a deserted wasteland due to neglect from the archaeology department and the local authorities. The archaeology department officials were not willing to comment on the condition of the Batkara site, claiming they are not allowed to speak to the media by their higher authorities. Despite repeated attempts, the higher authorities would not respond.